Early summer 2026 and Dex Northam is pleased with himself and the way he’s organised what he classes as his community, but still, the thought of what the future might bring excites him. The group on Lindisfarne are producing just enough food and are still able to find goods they can salvage on scavenging runs. But illness is a problem due to the this imposed lifestyle. Dex has a strong feeling the world will change again in the not too distant future. In the meantime he feels happy with life. The secret Lottie is keeping from her mother plays havoc with her mind, and is only the tiniest bit alleviated because she can share her concerns with Mac, her biker boyfriend. The enormity of it is overwhelming, making her impatient, sleep deprived and bad-tempered. She despises Dex and misses Heath but is scared of how Vicky will take the information, especially as she’s still living with Dex. Lottie has grown into someone she doesn’t recognise, a person who can hold a knife to someone’s throat if they threaten her. I remember the month after the virus kicked off, so clearly, but before that it’s all a bit sketchy. Like it was a long, long time ago. I don’t know her, that kid Lottie who ate ice cream watching dumb teen series on Netflix and arsed around online with her mates. I’m jealous of her for having nothing to make her feel overwhelmed and sick with fear. But I despise her, too, for thinking that all the trivial crap that went on in her little life actually mattered. In the south UK Central is expanding and Verlander is working towards an agenda he’s only sharing with a select few. Scouting parties are sent out to scour the country for pockets of survivors and bring in as many unsuspecting people as they can. Several Lindisfarne residents elect to leave, including Dex who has plans of his own. Through the thoughts and opinions of Doyle, Verlander and Dex, the unpalatable truth is revealed. The new world regime is not at all as promised and, for most, the better future doesn’t materialise. I love the way the characters are easy to connect with, brought to life as the reader is privy to each of their reflections and opinions, with chapters coming from various first person perspectives – namely Vicky, Lottie, Flora, Martin and Doyle. This approach gives a real sense of their personalities and how everyone’s method of coping differs. Other characters are given third person points of view which are just as hard hitting. The world building is convincing, chilling and vivid, it’s easy enough to imagine such a scenario. It seems UK2 is the least of the looming threats to the survivors however, and no-one is certain how much newcomers to Lindisfarne, Seren and Hawk, can be trusted. Terry Tyler’s books have never disappointed. Each one is individual yet they are all connected in a way, by the incredibly authentic characterisations, development, realistic dialogue and interactions, not forgetting the wonderful sense of place. Project Renova is a highly recommended series. 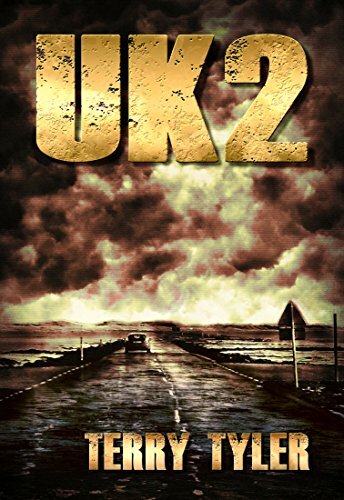 I chose to read and review UK2 based on an advance reader copy of the book supplied by the author. I am self-published and proud to be so, and have seventeen books on Amazon. The latest is UK2, the third of a trilogy from my post apocalyptic Project Renova series. The other books in the series are Tipping Point, Lindisfarne and Patient Zero. Earlier books: The Devil You Know is a psychological thriller based around a serial killer, and Best Seller is a satirical tale based on the modern publishing industry. Kings and Queens, Last Child and The House of York) are modern day re-tellings of historical periods in the Tudor and Plantagenet eras. The rest come under the general banner of contemporary fiction/family drama/romantic suspense. *excited squeal* can’t wait to get started on this book! I might just have to read the series again! Can’t wait for the spin offs. It’s just going to be the 100 years after novel, Cathy ~ both beta readers advised against doing short side stories about events that had already gone by; they thought it needed to move on. I wanted to write Aria’s story, about what happened when she left, and what happens to Naomi, and Lucas’s last hours, but my Mr Picky said ‘that ship has sailed’, and one regular reader said ‘I couldn’t give a f*** what happened to Aria, but I’d love to read about 100 years later’, which kind of made up my mind!!! That sounds good to me, Terry. Looking forward to it. I’d better not have any issues with UK – I spend enough on that site!! Yes, me too! I think we spend more on there than any other retail outlet, apart from possibly Morrisons! I do wonder about some book bloggers who only review books via ARC, but then there is so much more that most people buy from the site. I get all our vitamin tablets and stuff like that from there – I even get my perfume via the site. Yes, I buy lots of other things besides books. Never thought about perfume though! There’s a thought! I like a few of the Guerlain ones, and I think they’re up to £20 cheaper than in the shops, so I imagine it’s the same for many others! Wonderful review, Cathy. I loved the whole trilogy. Just read Terry’s comment about not doing the side stories. Bit disappointed but I can understand the beta readers’ view and if it means 100 years later will be out sooner then that’s fine with me. I do *not* want to find out, either. But, yes, that’s exactly what I got out of the shorter pieces: ‘What would I do here?’ It was fascinating to see how these vastly different characters dealt. This series is on my TBR list. Thanks! I’ve read the first two and hope to get to this one soon… Can’t wait! You have a treat in store!